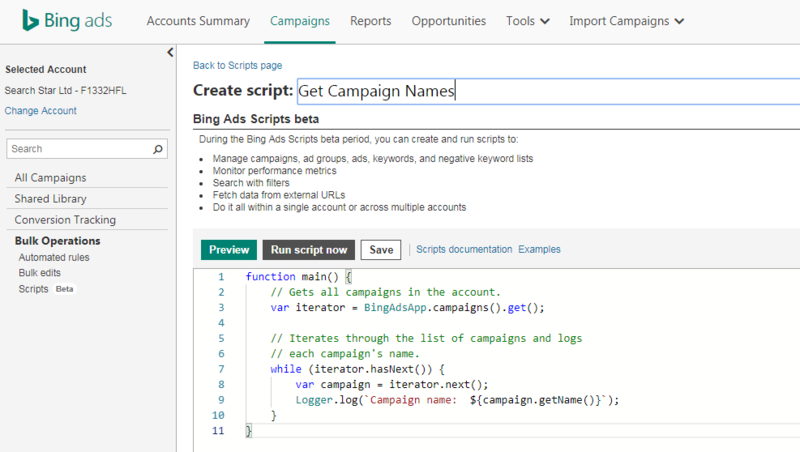 Earlier this month Bing announced the long-awaited release of Bing Ads Scripts. The tool has been rolled out into all accounts as an Open Beta feature of the platform. Being innovative folks here at SearchStar, we’re incredibly excited about this update from Bing. We’re big fans of scripts within Google Ads (have you seen our Innovation Hub?) and can’t wait to reap the rewards of getting them running in our Bing accounts as well. What Are Bing Ads Scripts? In short, Bing Ads Scripts are a way to programmatically carry out tasks within Bing Ads that you would otherwise do manually. 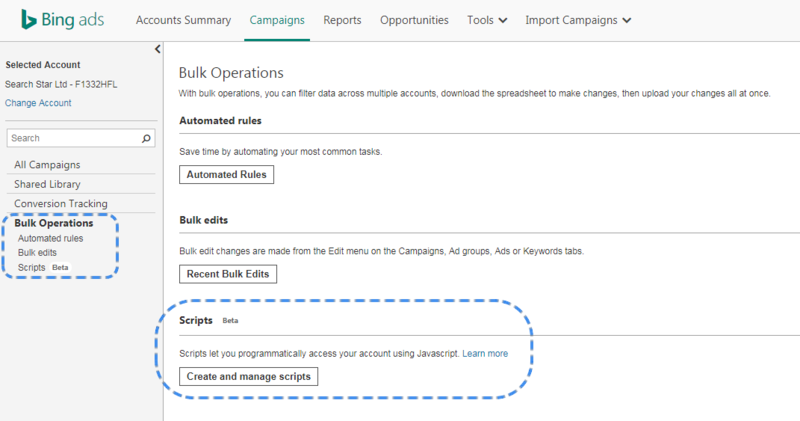 Almost every action you can take in Bing Ads to manage, report on, and optimise your campaigns can be done with a script. The largest benefit to using scripts is speed. What takes a human a couple of minutes to do, can take a script a few seconds. Although small, this time saving adds up when you start applying scripts to regular tasks such as reporting or daily campaign checks, and across multiple campaigns or accounts. How Do They Differ From Google Ads Scripts? Other than the obvious difference that they run within separate ad platforms, there are a few quirks between the two. With Bing Ads Scripts being brand new it doesn’t yet have all the bells and whistles we’re used to in its Google counterpart. For example, you aren’t able to access shared folders and documents such as OneNote or Google Drive, and it’s not yet possible to send automated emails. However, we predict these updates aren’t far away. Another difference, this one in Bing’s favour, is the “find and replace” function in Bing Ads Scripts. If you’ve already got a script set up in Google, and you want to make it work for your Bing campaigns as well, you can copy it from one platform to the other. However, there are slight differences in naming convention between the two platforms, which you might think you would be a very irritating pain point. But fear not, the “find and replace” function automatically searches for Google specific terminology, and substitutes in the relevant Bing names. This is a super handy tool that makes Bing Ads Scripts even easier to use. Now, let’s get down to the nitty gritty. You'll find the scripts interface in the bulk settings area within an account, or at a multi-account level. When you create a script in Bing Ads, you’ll be presented with an empty function called main. It’s this main function that is called when the script runs. You’ll also need to give your script a descriptive name so others can understand what it does. We’ve created a script here that gets all campaigns in the account and prints each campaign’s name to the script log. When you’re done writing your script, save it and test using the preview option. Running a script in preview lets you test that everything is working as planned, without making any changes to the account. Once you’re happy that the script is finished, click “Run script now”. You can also schedule scripts, so they run at regularly. We’ve chosen to run our script every Monday at 8am, but there are options for Daily and Monthly as well. Like we saw with Google Ads Scripts, the release of Bing Ads Scripts has been accompanied by a selection of code examples. There are also evangelists out there who have been paving the way with scripts and in many cases, they’ve done a lot of the hard work already. Google, Bing and the industry trailblazers often make their script solutions public online. Use them! They will have been slaved over for hours and thoroughly tested so don't try and go it alone. Take other people's work as a starting point and adapt it to fit your situation. Just make sure to credit people when you use their scripts. Scripts are a powerful tool in your paid search arsenal, but they can be a rabbit hole. Once you’ve written one and it's working as intended you may be spurred on to do another, and another, and another! Before you know it there are automated things happening everywhere and you don't quite know which way is up. Instead, view scripts as a means of solving a problem. If there's a mundane task you have to do in Bing Ads every Monday, there's probably a way it can be automated in scripts. If you're doing the same thing to 50 different campaigns a script will manage that task for you. If there is an external data trigger you want to combine with your search campaigns, a script will provide a dynamic solution. Start with clearly defined problem and use Bing Ads Scripts to solve the issue. Two slashes, “//”, at the beginning of a line will tell the programme reading the code to ignore that line. You can also create multi-line comments by wrapping a section of code with /* and */. Adding comments will make it easier for others to read and understand your script. They also make it easier for you to remember what you’ve written if you come back to it after a few days, weeks or even months. Comments can also be used to temporarily remove parts of code from execution when you’re testing a script. In the example below, we’ve “commented out” the instruction to print the campaign names to the script log. Bing Ads Scripts are here and are another vital step towards bringing the platform closer to industry-leader Google. Despite being in relative infancy, you can still achieve a lot with scripting in Bing and will save plenty of time if you embrace it. The “find and replace” function is an essential inclusion from Microsoft and gives Bing a bit of a head-start when it comes to scripting. It means that those scripts written for the Google ecosystem can be used immediately - remember tip 1; there’s no need to do it all on your own. Embrace the scripts already in the wild and you’ll be saving time in no time.